The Sense of Self fashion accessories store on Deck 4 of Celebrity Edge. Starboard Cruise Services has revealed a next-level shopping experience aboard Celebrity Cruises’ newest ship, Celebrity Edge. The visionary vessel is set for her maiden voyage, a seven-night sailing on December 9th, from the brand new Terminal 25 in Port Everglades, Fort Lauderdale, FL. Among the many highlights of the inaugural season is the naming ceremony by the ship’s godmother, Nobel laureate Malala Yousafzai. Malala was on board for the ceremony December 4 and unveiled the custom Malala Fund merchandise collection developed by Starboard with proceeds benefit-ting her global campaign for girls’ education. Selections from the exclusive Malala Fund Collection onboard Celebrity Edge. 100% of the proceeds will go to benefit her global campaign for girls’ education. 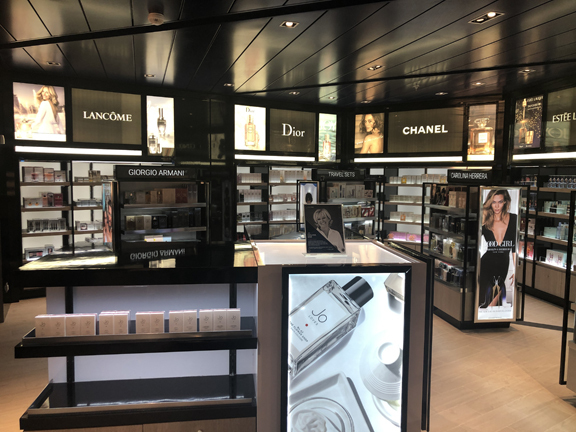 Covering more than 7,000 square feet on decks 4 and 5, The Celebrity Shops on Deck 4 include To the Edge (Branded Lifestyle); The Gem (Fine Jewelry); Time Is Now (Timepieces); Attraction (Beauty); Spirited (Spirits); and Sense of Self (Fashion Accessories). Deck 5 features the Bulgari Boutique, Cartier Espace and the Tiffany & Co. Boutique. The Time is Now watch store. 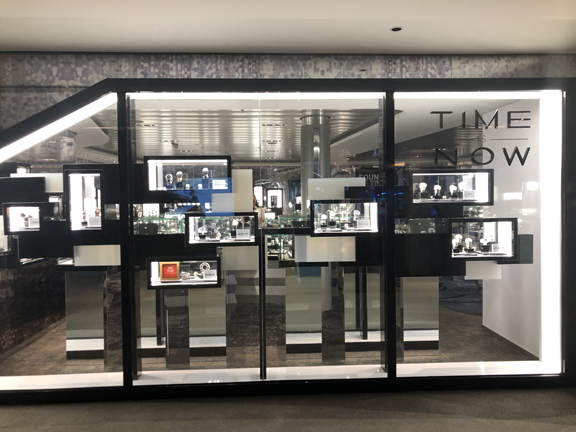 From fine jewelry to watches, beauty to spirits, The Celebrity Shops feature a lineup of brands, exclusive products and discovery events that engage all five senses. Celebrity Edge’s innovative retail ranges from modern luxury to brands with a purpose that go beyond commerce to include empowerment and environmental sustainability. In addition to the Malala Fund Collection, Celebrity Edge features Shinola, the watch brand leading Detroit’s manufacturing renaissance; and environmentally-conscious companies committed to reducing plastic waste, 4Ocean and S’well. Kallati ring inspired by the Edge’s Luminae Chandelier. Empowerment includes Kallati Jewelry, Malala Fund Collection, Melissa Odabash, Rae Feather, John Hardy, Veuve Clicquot and S’well, each of which was founded, led and/or inspired by dynamic women. 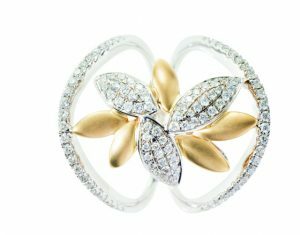 The John Hardy fine jewelry brand is also working towards environmental sustainability, and has founded a campaign to replant bamboo in Bali, where the company is based. Edge Steel Collection: A limited-edition fashion jewelry collection made from the first cut of steel used to build the ship. Pieces are inspired by elements of the ship’s architecture and design, such as the Magic Carpet, the outdoor movie screen on the Pool Deck and design features in the Solarium. Kallati Edge Captain’s Collection: A limited-edition fine jewelry collection by Reout Kallati, CEO and designer of the Kallati jewelry brand. The pieces were inspired by the architectural features of Celebrity Edge. 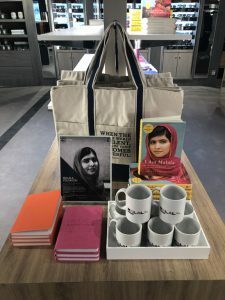 Malala Fund Collection: A special assortment of best-selling books and custom keepsakes inspired by Nobel laureate Malala Yousafzai, the ship’s godmother, and her global education campaign for girls’ education. Celebrity will donate 100% of the proceeds to her Malala Fund. Celebrity Edge logo collection in store. Celebrity Edge Branded Collection: One-of-a-kind exclusive apparel, home and collectible products, designed to celebrate Celebrity Edge. The Celebrity Edge retail experience is created as a Sensory Shopping Journey that draws guests into a series of experiences that engage all five of their senses. The journey includes Feast Your Eyes with fine jewelry from luxury brands, Sounds of Time with timepieces from top brands including Bulgari, Cartier, Citizen, Fendi, Gucci, Hublot, Michelle, Shinola and TAG Heuer and Scent Soiree with skincare and fragrances. It also encompasses Spirit of Taste with premium spirits several of which that are offered exclusively on Celebrity Edge, and Perfect Touch with leather goods and accessories from Coach, Marc Jacobs and Swarovski, plus discovery brands such as Aspinal of London, Rae Feather, Mary Frances, Melissa Odabash and Orlebar Brown. In another bold retail move, Starboard will debut several first-at-sea brand concepts for Celebrity Edge, including the Vintage Watch Collection, limited edition vintage timepieces specially curated by Starboard with renowned brands like Jaeger-LeCoultre, Omega, Patek Philippe, Rolex and Vacheron Constantin. 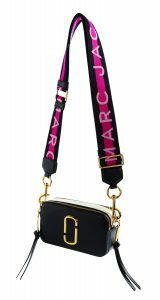 Celebrity Edge Marc Jacobs Snapshot bag. 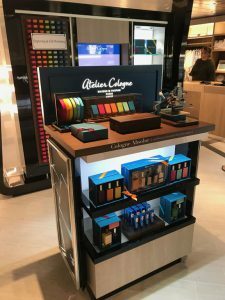 Atelier Cologne, a fragrance house offering exclusive scents and bottles that can be monogrammed, is also debuting at sea onboard Edge, as are handbags by American designer Marc Jacobs. Starboard has also customized a selection of exclusive Celebrity Edge retail experiences. Art/Jewelry Walk with Kallati Edge Captain’s Collection: A guided tour of the ship and the design elements that inspired the limited-edition, numbered jewelry collection. Women with Edge: A morning, meeting spotlighting the influential women behind many of Celebrity Edge’s brands, with stories of these accomplished women, from Malala Yousafzai to several notable entrepreneurs. Atelier Cologne Consultations: Guests enjoy a personal consultation with a fragrance expert and get to take home a personalized scent selection. Jo Loves Fragrance Tapas Experience: An opportunity to learn about Jo Loves fragrances in a fresh, innovative way. Tradition of Time Seminar: Explores the history of timepieces, from sundials to smartwatches, and celebrates the evolution of timekeeping with a brief watchmaking demonstration. Sail to Bali with John Hardy: A hands-on workshop where the store is transformed, and guests can feel as if they’ve sailed to Bali, where traditional jewelry-making techniques inspire John Hardy’s designs. The workshop includes the meticulous eight-step process used by John Hardy’s own artisans. Starboard has a long-standing retail partnership with Celebrity Cruises and, with the addition of Celebrity Edge, manages retail operations on 10 of the cruise line’s 13 ships. By 2020, Star-board will operate with more than 750 brands on more than 90 ships, confirming its position as the largest cruise retailer in the world, says the company.